One of the amazing things that surprises many people the first time they choose to book a cruise is how flexible cruises can be. Many people think that cruises all last roughly the same amount of time and visit the same destinations, but there are many different cruise lines, ships, and routes to enjoy all around the world, with new cruises added to the calendar each year and new ideas constantly being explored. This means that no matter what kind of budget you’re working with, how much free time you have, or where you’d like to go, you’ll be able to find a cruise for you, and 5 day cruises are some of the best options in general as they tend to offer enough time to visit more than one destination, while also not being too long so as to become extremely expensive. A 5 day cruise is a great way to spend some quality time with your friends and family exploring exotic destinations all over the world. See below for details on a few of the best 5 day cruises. One of the best rated 5 day cruises you can take right now is the '5 Night Western Caribbean' out of Mobile, Alabama down to some beautiful locations all around the western side of the Caribbean Sea. This cruise is available at some great prices, with standard staterooms available for less than $250 if you book in advance and use cruise comparison sites and tools. For this cruise, you'll be traveling on the Carnival Fantasy, and it really will feel like you stepped into a fairy tale when climb aboard this amazing ship and take a look around. Beautifully decorated, furnished, and laid-out, every deck of the Carnival Fantasy is a joy to behold and has a lot to offer. You'll find something new and exciting to do and experience on each and every day of this 5 day cruise, meaning you'll never get bored and will have plenty of opportunities to make some magical memories with your friends and family members. This cruise sets off from the port of Mobile, AL and makes a total of two stops. The first stop is at Progreso on the Yucatan Peninsula of Mexico. Some great nature trails and beaches can be found at Progreso, or you can choose to make a short journey round to the state capital of Merida for even more excitement and attractions. Next, you'll visit the amazing Caribbean island of Cozumel. A hugely popular spot with scuba diving enthusiasts, Cozumel is blessed with some of the softest, whitest sands you'll ever feel beneath your feet and has an abundance of tropical fish and other marine life swimming around beneath the waves just a short distance off the shore. Set off from Jacksonville, Florida on the journey of a lifetime with this amazing '5 Night Bahamas' cruise from Carnival. Perfectly suited for people of all ages and ideal for everyone from couples to families to groups of friend, this Bahamas 5 day cruise is a great option and offers amazing value too, with rooms available for around $50 per night if you book in advance. For this cruise, you'll enjoy the comforts and amenities of the highly rated Carnival Ecstasy. Fitted out with the standard sort of features you'd expect to find on any Carnival ship, the Ecstasy really excels in terms of both dining and entertainment. For dining, you'll find all sorts of great restaurants on board offering both casual fare and more speciality, gourmet-style meals. For entertainment, you'll find swimming pools, a casino, water slides, live shows, sport courts, activities, and more. This cruise sets off from Jacksonville and makes two stops. The first stop comes at Princess Cays. Located on the island of Eleuthera in the Bahamas, around 50 miles away from Nassau, this is a private island paradise with soft white sands, luxuriously warm waters, and amazing scenery in every direction. Next, the cruise ship will take you over to Nassau itself, where you can really enjoy an authentic slice of Caribbean life in one of the busiest and most vibrant cities in the whole region. 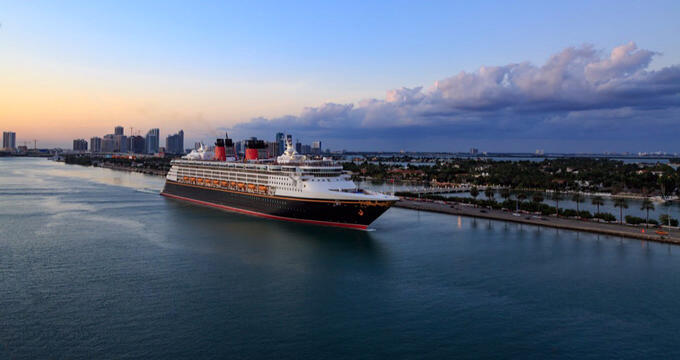 One of the most magical experiences any child or adult could ever hope to enjoy is to sail on a Disney Cruise Line cruise ship to an exotic destination, and that's exactly what you can enjoy on this '5 Night Eastern Caribbean' cruise from Disney. As this is a Disney cruise, you can expect to find a lot of Disney movie magic on board, with character meet and greets, Disney merchandise sales, live shows themed around the various films of Disney, and much more. You'll find all of that on more on board the exceptional Disney Magic. One of the most famous cruise ships in the world, the Magic has been lovingly decorated and designed to bring the wonders of Disney to life in a million different ways. Even the carpets on this ship have been stylized in Disney fashion, and you'll find lots of different Disney themed restaurants, shows, entertainment, swimming pools, shops, water slides, and more on the ship itself, along with dozens of fun games and activities for both kids and grown-ups to enjoy. For this cruise, you'll set off from New York City itself and make a total of two stops around the Eastern Caribbean. The first stop will be at St John's on Antigua. St John's is actually the capital city of Antigua and Barbuda, and it's here that you'll find some key landmarks and interesting sites like the Museum of Antigua and Barbuda, the St John's Cathedral, and the Government House. Next, your Disney cruise ship will take you over to San Juan, the capital of Puerto Rico. There, you can explore the colorful old buildings of Old San Juan, spend an evening among the bars and clubs of the Condado area, or visit key castles and forts like the Castillo San Cristobal or the Castillo San Felipe del Morro.